BELGRADE, December 19. /TASS/. Serbia’s Prime Minister Aleksandar Vucic said he plans to discuss possible purchase or six Russian MiG-29 fighter jets when he will pay a visit to Moscow on December 21, Tanjug reported on Monday. Along with the purchase of more planes, it is planned to negotiate repair and modernization of Serbia’s MiG-29 jets. Minsk plans to purchase Russian Su-30SM-type multirole fighters, Belarusian Defense Minister Andrei Ravkov said Wednesday. “Thanks to the well-established interaction with domestic enterprises within the defense sector, the armed forces are carrying out the modernization [capital repairs] of its existing models of aircraft. However, the defense ministry is interested in purchasing the latest models of aircraft,” Ravkov noted. The Su-30SM is a 4+ generation fighter jet, developed by Russia’s Sukhoi Company. It is a two-seat derivative of the earlier Su-27UB (NATO reporting name: Flanker) capable of air-to-air and air-to-ground missions with a wide variety of precision-guided munitions. The aircraft features thrust-vectoring engines to enhance maneuverability. Russia has formed the first wing of deck-based MiG-29K/KUB fighters and placed them into service as part of the Navy’s aviation arm. Along with the Su-33, these will now be part of the mixed wing on the only Russian aircraft carrier, the Admiral Kuznetsov. Fleet headquarters informed RIR that an updated aircraft carrier group will set out to sea for the first time this summer. In autumn, the group will go on combat duty in the Mediterranean Sea. Russia is readying the first regiment (24 aircraft – approx. Ed.) of deck-based MiG-29K/KUB fighters for combat duty on the aircraft carrier Admiral Kuznetsov, of the Northern Fleet. Pilots are currently being trained on the new aircraft in Crimea and, starting on July 1, they will begin performing tasks to protect Russia’s maritime borders. What kind of a fighter is this new MiG? Andrey Fomin, chief editor of Vzlyot Magazine, said these deck-based MiGs are the latest serially produced 4++ generation fighter jets. “Despite its resemblance to the land-based version of the MiG-29, this is a completely different aircraft. This applies to its stealth technologies, a new system of in-flight refueling, folding wings and mechanisms, by which the aircraft has the ability to perform short take-offs and land at low speeds,” the specialist told RIR during an interview. The Su-33 was created as an aircraft to ensure air superiority in any conflict, said Fomin, meaning it is a full-fledged fighter-interceptor. The MiG-29K/KUB is a multi-role aircraft, designed to provide air defence for naval forces, as well as to destroy surface and ground targets with guided high-precision weapons, day or night and in all weather conditions. The MiG-29K has an advanced airframe containing a high proportion of composite materials, and fly-by-wire controls system with quadruple redundancy. The fighter’s internal tanks can hold 50% more kerosene than its predecessor. Three additional fuel tanks can be suspended under the fuselage and wings. As a result, the operational range of this fighter has significantly increased, as well as its combat loading. The land-based version of the MiG-29 can carry a total of 4 tons, while the deck-based version of the aircraft can be armed with 6.5 tons of precision-guided munitions. Its arsenal of weapons includes the latest supersonic anti-ship cruise missiles X-31 and X-35, and air bombs with television guidance systems. For whom was the MiG-29K/KUB originally created? “In 2009, the built for India MiG-29K made its first landing on a Russian aircraft carrier with a deck similar to that of the Admiral Kuznetsov. Many systems used on this fighter jet, at the request of the Indians, were not produced in Russia. For example, there were the French navigation system SIGMA 95 and a series of other equipment which, for obvious reasons, would be impossible to put into service in the Russian armed forces,” said Fomin. In the new “Russian” MiGs, foreign electronics have been replaced by domestic versions, and the “friend or foe” identification system has been completely rebuilt. “This is one of the reasons why it took so long to introduce these fighters into service on the aircraft carrier”, said Fomin. Where are they preparing pilots for the MiG-29K/KUB? Pilots for the MiG-29K/KUB fighters are npw being trained at an aviation test centre in Crimea, in the city of Saki (1,400 km south of Moscow – approx. Ed.). A ramp and landing pad that fully simulate the deck of the Admiral Kuznetsov have been built, with all their propulsion and braking systems. This allows pilots to practice taking off and landing on the deck of a ship, in conditions close to real life conditions. A representative of the Navy said that the current system of training pilots for deck-based aircraft includes preliminary ground-based training. This is the only way, in contrast to the ship, that a pilot can make training mistakes safely. For example, he might not reach the arresting gear; or, he might overfly it. This is not possible on a ship, where there are only 46 metres to the first brake cable, and if the jet fails to hook onto it, a chance for a second attempt might never occur. Vadim Kozyulin, Professor at the Academy of Military Sciences, said the Defence Ministry, for now, has no plans to build any new aircraft carriers. “The emergence of these new MiG-29K/KUB aircraft, as part of the air wing of the aircraft carrier Admiral Kuznetsov, is a very important step in the development of the carrier-based aviation school in Russia. In the future, these aircraft will become the backbone of ship-based aviation groups, he said. Russian military base in Armenia received 4 MiG-29 repaired and MiG-29S modernized fighters and a Mi-8MT transport helicopter. Military transport aviation delivered the new and repaired hardware to the Erebuni base. In the nearest time the servicemen will test the new hardware. At present, there are four-generation 9 fighters at the base. MiG-29S has an extended fuel tank, modernized ejection seat and modernized radar station. Russia may be planning to deliver MiG-29 fighter jets to Serbia, according to a source in the Russian Federal Service for Military-Technical Cooperation. 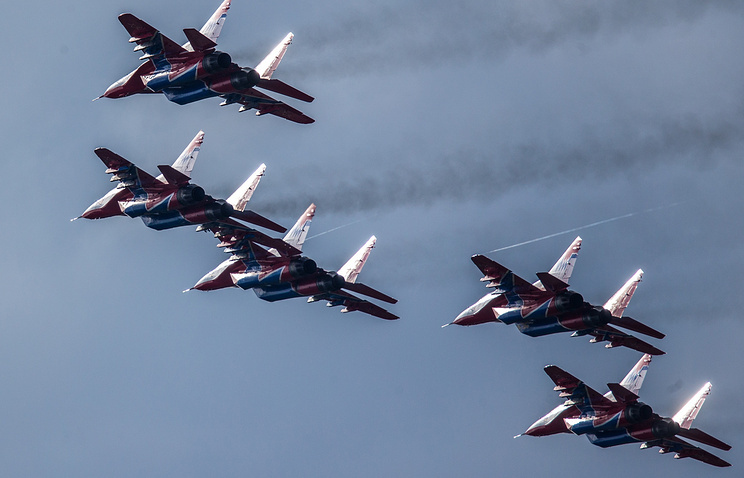 MOSCOW (Sputnik) — Russia is considering possibly delivering air defense systems and MiG-29 fighter jets to Serbia, a source in the Russian Federal Service for Military-Technical Cooperation (FSMTC) said Wednesday. “We are working on the issue of deliveries of air defense systems and MiG-29s to Serbia. This country is our strategic partner in Europe, in many spheres, including military-technical cooperation,” the source told RIA Novosti. Last month, the Russian newspaper Kommersant reported that Serbia was hoping to buy Russian-made Tor, Pantsir, and Buk air defense systems as well as MiG-29s.The Serbian Defense Ministry has reportedly submitted a detailed list of the weapons and spare parts it would like to purchase to the FSMTC.